Steelix in game: 550 Who? Important notice! Pokemon Steelix is a fictional character of humans. 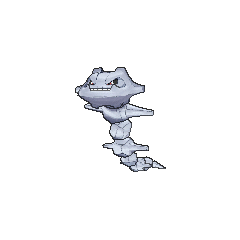 Steelix burrows underground and can be found in mountains or caves. It lives deep underground, and has been found as deep as six tenths of mile. It is capable of chewing through boulders with its powerful jaws, and its eyes are capable of seeing in the dark. Its body is made harder than diamond by the iron it ingests when it eats soil. It's further strengthened by the pressure and heat underground. Brock's Onix evolved into a Steelix sometime before Grating Spaces while it was being trained by Brock's little brother, Forrest, in the Pewter City Gym. 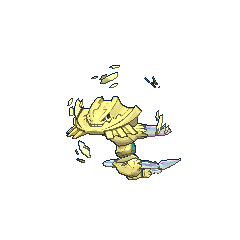 Steelix first appeared as one of Jasmine's Pokémon in Nerves of Steelix!. Jasmine first used Steelix to help Ash stop Team Rocket from stealing Pikachu. Then during the Gym battle, Ash's Cyndaquil managed to defeat it, winning Ash the Mineral Badge. Harrison used a Steelix against Ash during the Silver Conference in Playing with Fire. It defeated Noctowl but was defeated by his Snorlax. 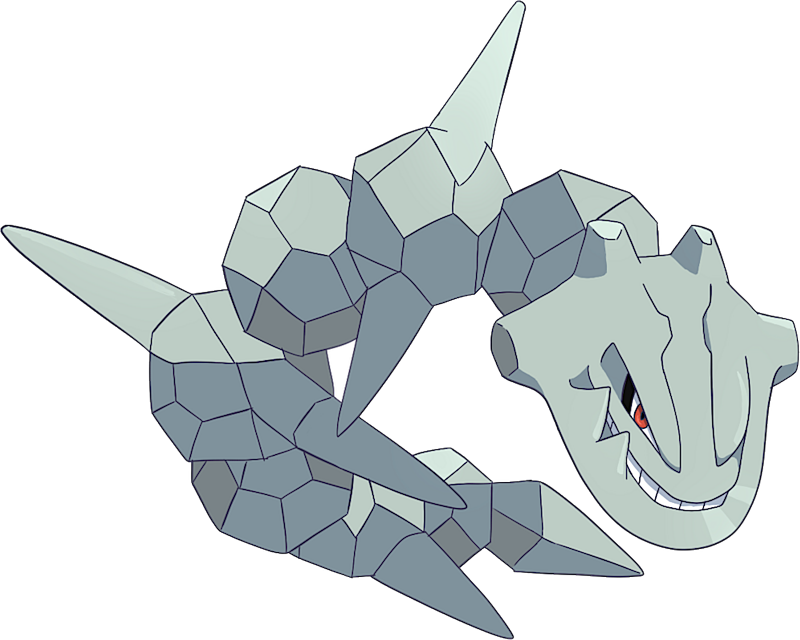 A Steelix was one of the three Pokémon used by Attila and Hun of Team Rocket in The Legend of Thunder!. In All Torkoal, No Play, a Steelix from Steel Valley was scaring the wits out of a wild Torkoal that would soon belong to Ash. Morrison's Steelix debuted in Saved by the Beldum and later battled Ash in Choose It or Lose It!. 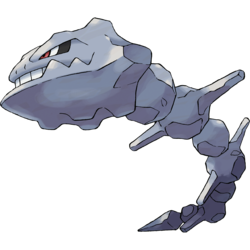 In Dealing With Defensive Types!, a Steelix belonging to Byron was used in the Gym battle against Ash. It put up a tough fight, defeating Ash's Buizel, despite its type advantage and then fought against Ash's Chimchar. Despite its exhaustion from its earlier battle, Chimchar was able to defeat Steelix after a prolonged battle. Steelix appeared in Steeling Peace of Mind! and Saving the World From Ruins! where it was one of the Steel-type Pokémon on Iron Island that had gone crazy due to Team Galactic. A Steelix that can Mega Evolve appeared in Volcanion and the Mechanical Marvel, under the control of Levi and Cherie's Mega Wave. A Steelix under the ownership of a Coordinator appeared in Team Shocker! participating in the Performance Stage of the Solaceon Contest. A Steelix made a brief cameo in the second Diamond & Pearl series movie, Giratina and the Sky Warrior. 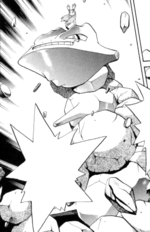 A Steelix that can Mega Evolve into Mega Steelix appeared in Mega Evolution Special II. A Steelix appeared in Hoopa and the Clash of Ages. A Steelix appeared during a flashback in The Redemption as one of the many Pokémon fighting in the great war of Kalos, 3000 years previously. 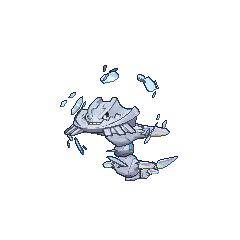 A Steelix appeared in The Last Battle XIII as one of the Pokémon sent to help the fight in Ilex Forest. Years later, Carr of the Team Rocket beast trio used one against Red's Poli as they clashed in the Sevii Islands. It was swung aside rather easily as it was interrupted in its rampage, and after a failed Iron Tail, it was beaten by a smart Mind Reader maneuver. Another was on Iron Island and was used for training with Riley. 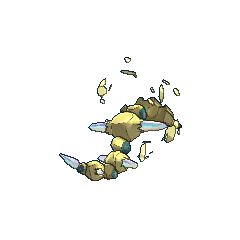 Byron has two Steelix which were used in the challenge in which they served as walls to prevent Hareta from getting to the top in Challenge! The Fortress Of Steel!!. Flint mentions having a Steelix in Hareta's Heart's Desire but it was never shown. Erases blocks (max 10), and also does damage to the foe. Steelix is the only Pokémon so far in the Pokémon Ranger games that can hurt the Capture Styler simply by touching the line. Mega Steelix is the tallest Steel-type and Ground-type Pokémon.